Never the less, I had a chance to play with Zinthian for two days with external usb card - worked fine (with reasonable latency and some rare dropouts on Pianoteq) but from tonight it gives me an error on the white screen. Amazing - I am completely surprised with the quality of some sounds, MOD-UI and everything - crazy cool ! I was dreaming of playing with Pianoteq with small setup on live sets before for more than 10 years, now dream comes true, thanks to you guys !!! Back to my quest: with Audioinjector everything starts, encoders work, screen works but now sound. Please advice me a course of action or redirect to the person on the forum to ask all my questions. Hope I am not violating forum rules by writing you directly. I think it would be better to open this thread to the community. Audioinjector Stereo is a tricky beast, sometimes hard to tame. I will try to help you as much as i can, but other members could contribute with useful tips too. BTW, have you tried to adjust the levels using “alsamixer” from command line? This is done by the webconf when you select Audioinjector. but using the Alsa sliders would be my first try as well. Webconfig was the first thing I tried and it helped me with the boot screen error and let me in to the main screen. But even with chosen audioinjector alsa doesn’t see it and there is still no sound. Usb audio also doesn’t work any more. Should I try with fresh image ? But I didn’t mess with configs much. ! My setup with temporal 3d printed box. Next step for me is to try if my audioinjector stereo works at all in separate setup (just with Raspbian distro or similar). And if it doesn’t! i will see from there further (maybe discuss hardware issues with the vendor). Hope I will make zynth work soon this way or another ! Thank you @jofemodo & @mheidt for your support !!! Fresh image with all the updates and the instructions from here https://github.com/Audio-Injector/stereo-and-zero helped (both, drivers and alsactl commands). Audioinjector works nicely now. Will submit to successful cases, when the project will be complete. Was ist necessary to install the .deb? Did you test it without installing it? If the new fresh and updated image didn’t work we have to integrate the script. My Audioinjector Zero works without the script. I have got an upgrade (New rpi3 B+ 2017 and Samsung EVO 32Gb MicroSD) to check the installation once again. It didn’t work out of the box for me after selecting Audioinjector (mine is stereo model) in webconfig. I’ve started zynthian with Rpi3B 2015, and same simptoms, so it is probably not just B+. Anyway, I really hope my case will help the others with same configuration to get everything to work in no time. @mheidt, thank you very much for your support and input ! Right now I am in testing state and already have discovered some things to ask in forum. I recently bought a Zynthian Bundle All Alu-case Kit v2, I have assembled it in a few hours and it worked at the first trial. Thrilled by this immediate success, and having a working ‘reference’ unit, I decided to assemble a second, minimal, headless unit using some components I had lying around from a previous, aborted, try to build a Zynthian. Mouse, Keyboard, USBMidi keyboard, monitor on HDMI, PC connected to ethernet. At each boot I had to login to the router to see the IP address of the Zynthian, because it kept changing. After a few iterations of the update process, I logged in again to the webconf page. Only after having enabled the output of the sound card in alsamixer, I finally managed to hear the Audio test. Then, trying to move in the Zynthian GUI with mouse and touch screen, I managed to play with Aeolus and Dexed. Going back to the layer screen is something that just doesn’t happen when you want to. 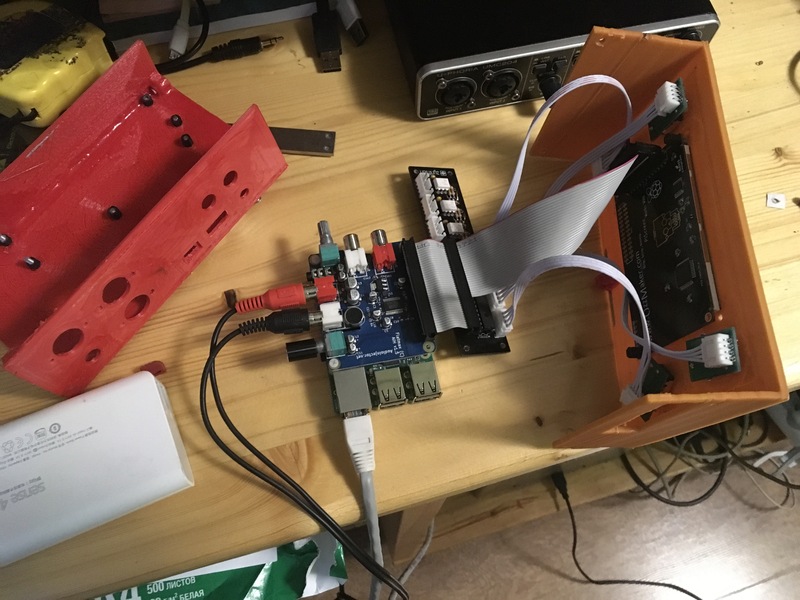 In the case you want to experiment, AudioInjector seems to be the worst choice, considering that, as far as I understand, at the current state of the project there are no applications for the audio input. Choosing this board is looking for troubles. Any suggestion to fix my problems is more than welcomed. In the meantime I’ll enjoy the standard working unit. You can try to connect to zynthian.local. Sadly, it doesn’t work, not even with the official unit … I had to connect using IP. Display: search the forum and the page of your display. Consider that the visual orientation and the touch matrix are 2 different settings. I only opened the alsamixer from the ssh console, is there a way to access it via webconf? I did not even know that the 2 outputs (3.5 jack and RCA pins) were separate. I couldn’t find the schematics but I took for granted that they were just the same hardware out either in parallel or just decoupled but not separate mixer channels. Anyway messing with the alsamixer from console didn’t enable the RCA outputs. As far as the touch screen is concerned, I just fiddled with the rotation parameter in the webconf, but rotating the display took along the touch screen rotation. At some point I had the display upside down and the touch screen with x/y exchanged. Is there a way to configure this by editing some config file from console? There was a bug in the webconf. Now when you select Audioinjector in the audio panel, the mute issue is solved.